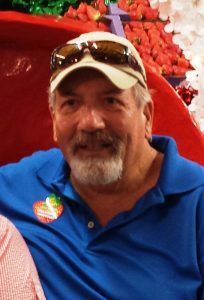 BROOKSVILLE, Fla. – Ronald E. McAllister, 71, of Jay, Maine, and Brooksville, Fla., passed away surrounded by his family on Christmas Day, Dec. 25, 2018, at the Oak Hill Hospital in Brooksville, Fla. He was born Sept. 18, 1947, in Farmington, the son of Elywin McAllister and Leanese (Robbins) McAllister. He was a 1965 graduate of Farmington High School. On Nov. 1, 1969, at Bean’s Corner Church, he married Pamela Bubier of Jay. Sports were a very important part of Ron’s life. He started playing Little League Baseball in Strong, Maine. Some of his teammates from then were a part of his future teams for the Strong Town Team Baseball and as time passed, they moved on to softball, with even some slow-pitch softball thrown in. One of his proudest moments in sports was receiving an MVP award for a slow-pitch tournament in Stratton; he had a fantastic weekend pitching and hitting. Other interests included bowling, snowmobiling (with many memorable trips throughout Maine and into Canada) and watching stock car racing at racetracks from North Carolina to Nova Scotia and many points in between. A “ride along” at Daytona International Speedway was a special racing treat for him. One of his best sports memories was in 1976, when he and other friends from Strong drove a motorhome to Montreal, Canada, to see the Summer Olympics. Muhammad Ali was one of the athletes who he especially remembered seeing. As many know, as Ronnie aged, a 4-letter word became the center of his sports world – GOLF! He just loved golf. He played with his father, his father-in-law, his son, many friends, the “Northern Tour,” the “Wednesday Travel League,” and in Florida he only got to play on Monday, Wednesday and Friday, unless there was another day he could fit in. After graduating from the University of Maine in Orono in 1969, he worked in the accounting field with various companies in the Farmington area, until he decided to go on his own in the early 1980s, when he opened McAllister Accounting and Tax Services. Later, his son, Marcus, joined him in the practice. Even though Ronnie was supposedly retired, he was still doing taxes. The family is very proud of Ron’s commitment to helping. When his kids were young he coached baseball and soccer for AYS. Over the years he served as Treasurer of the Wilson Lake Country Club, Jay-Niles Memorial Library, and Foothills Land Conservancy. He was a member of the Maine Association of Professional Accountants, serving as president for two years. He was actively involved with Otis Federal Credit Union: In 1995, he joined the supervisory committee and served until 2005, when he joined the board of directors; he served as chairman of the board from 2008-2013, and was still a current member of the Board. In all, he served 23 years for the Credit Union. Survivors include his wife of 49 years, Pamela; his son, Marcus, and daughter-in-law, Angela; his daughter, Marcia, and her friend, Donald Osier. He also leaves his favorite grandson and granddaughter, Liam and Ashlin McAllister. He also leaves a sister, Nancy, and her husband Lester “Mick” Lawrence of McAlpin, Fla. He was predeceased by his parents, Elywin and Leanese McAllister. The family would like to extend special thanks to the ICU nurses at Oak Hill Hospital and especially to Ron and Pam’s friends in Sylvan Grove, who were so helpful to the whole family. Funeral service will be held 1 p.m., Saturday, January 5, at FINLEY FUNERAL HOME, 15 Church St., Livermore Falls, Maine. Visitation will be held 4-7 p.m., on Friday, January 4, at the funeral home. Interment at a later date at Fairview Cemetery, Farmington, Maine.